In 2015, Apple’s first official Android app – Apple Music for Android, says hello to the Android fans. It provides an access for Android users to listen to 40 million songs, including exclusive albums and Apple's Beats 1 radio station. This is definitely an inspiring event. However, after a period of experience, the application has courted disappointment among the users. Firstly, Apple Music on Android is available for devices running Android 4.3 and up only. Secondly, a great many users complain about the absence of useful voice control and the frequent presence of annoying sluggishness & bugs . Thirdly, most Android users have been using their phones as an MP3 player for a long time but Apple Music for Android can’t work as a media player to listen to music files. What is the best way to sync Apple Music to Android? 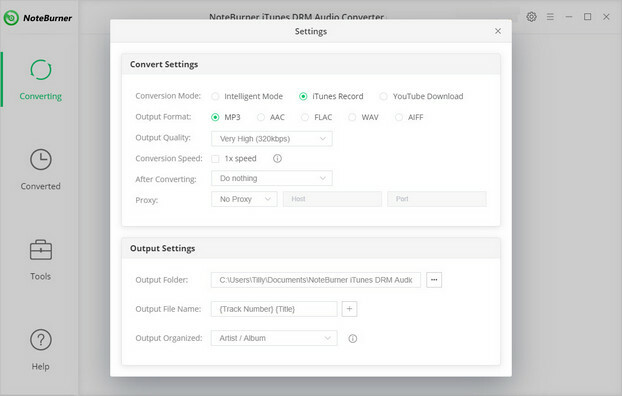 This tutorial will give you a satisfying answer with NoteBurner Apple Music Converter step by step. 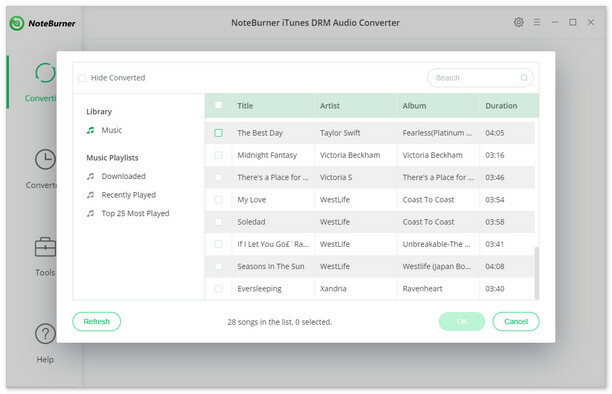 NoteBurner Apple Music Converter is a user-friendly software that can easily remove the DRM from iTunes audio files, including Apple Music, Audiobooks and M4P music. It is able to convert DRM-protected iTunes music to common formats, such as MP3, AAC, WAV, etc. Moreover, its' fast conversion speed and high compatibility with the latest operating systems have been receiving well acclaims from worldwide users. To sync Apple Music to Android, we just need to convert Apple Music to DRM-free formats and then transfer them to Android devices. Therefore, here we will devide the whole process into two parts: 1) Strip the DRM from Apple Music; 2) Transfer Apple Music to Android. Launch the program, you will see a concise interface as below. On the upper right corner, you can click menu >> Language to choose other 13 languages besides English. Click the button "+" on the upper left, and then you will see a pop-up window which will show you all the songs you've downloaded from iTunes Library. Now choose the Apple Music that you want to convert and press OK.
Click the gear button on the upper right and a window will pop up to allow you to choose Output Path, Output Formats (MP3/AAC/FLAC/WAV), Conversion Speed, etc. Click button "convert", and all the Apple Music you chose in Step 2 are being converted to the format you selected in Step 3 and downloaded to the designated folder in accordance with your output path. When Step 4 is done, click the history button (shaped like a clock) on the upper right. Here you can find all the converted songs. You can also directly go to the output folder you selected in Step 3 to find the converted Apple Music. Until now, we've finished stripping the DRM and the next step is to transfer them to Android. Since all the songs we get now are in DRM-free format, we can transfer them to anywhere we like. Now we will show you two ways to do it: Method 1 is a traditional way and is widely known among us. 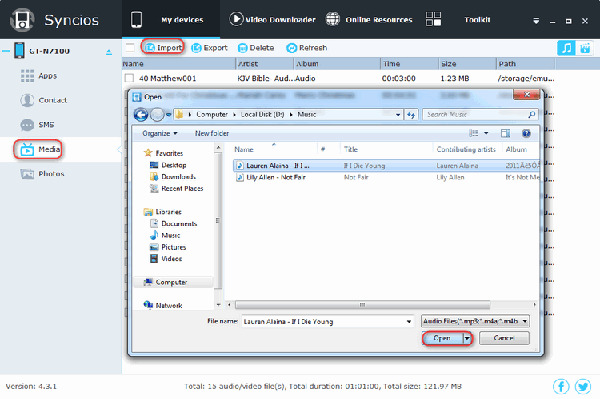 What worth being paid attention to is Method 2 - a fashionable and efficient way to sync music or other files to Android. It's very easy to copy the music and paste them to the location you want, thus we will just show you the simple steps: Find the converted Apple Music >> Copy the folder or the songs >> Paste them to the destination you want them to be in your Android devices. 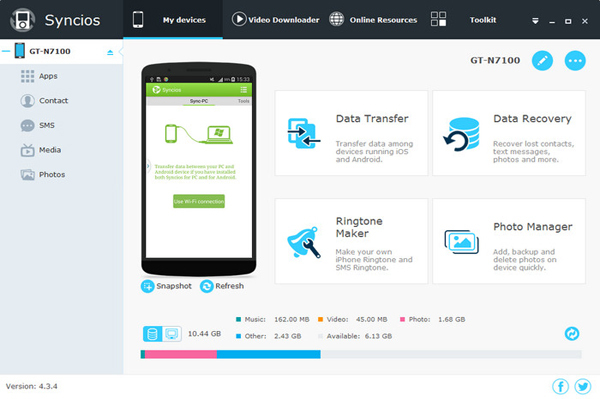 Syncois Android Free Manager is a freeware that can transfer, edit, backup, manage, view Android & iOS mobile data: Music, videos, photos, apps, ebooks, contacts, messages, etc. It's fully compatible with the two dominant smartphone operating systems – Android and iOS. How can we do with it? Let's find out more details. Simply press Media tab on the left panel of Syncios. Then click Import to browse music files on your PC. Finally, find the Apple Music that you want to transfer and click Open to import selected music from your PC to the Android devices. All done! Have you successfully synced your Apple Music to your Android devices? You can write a review below and share your experience with us.